Investors are aware of the importance of common factors in international bond markets. If yields across countries depend on each other investing abroad does no longer diversify domestic interest rate risk away. Therefore, international investors immediately benefit from identifying and modeling these factors. This paper provides an economic analysis of common factors of two major government bond markets. 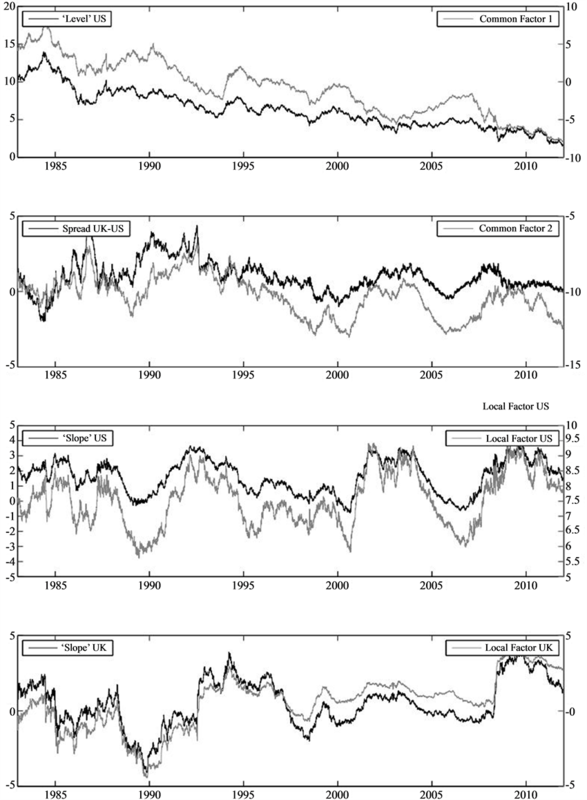 A principal component analysis of US and UK treasury yields in the period of 1983 to 2012 identifies and interprets the factors that drive the international variation. I propose a joint affine term structure model (joint ATSM) to match these factors and study the interaction of empirical and model factors. applies a principal component analysis to US bond returns and find three factors which correspond to the “level”, “slope” and “curvature” of the yield curve. finds that “level”, “spread” and “steepness” determine a large part of the variation in bond returns from the US, Germany and Japan. studies treasury yields from the US, UK and Germany and concludes that “level” and “slope” govern the most of their variability. - propose joint ATSM’s to match these common factors in two-currency term structure models. adds an additional risk driving factor to capture the volatility of exchange rate movements. In contrast,  - include time variation in the risk premium to cope with the difference in variation of interest rates and exchange rates. provides a classification for completely affine ATSM’s in the  sense. The contribution of the present paper is twofold: Firstly, I provide a factor analysis of US and UK treasury yields in the period of 1983 to 2012. In sum, two common factors explain 85% of the variation of these two major bond markets. I propose a joint ATSM and, to the best of my knowledge, I am the first to provide an economic intuition of the latent factors. The remainder of the paper is organized as follows: Section 2 provides a factor analysis of the treasury yields. Section 3 proposes a joint ATSM to match the common and local factors. Section 4 links the empirical and model factors and the paper concludes with Section 5. The US and UK zero coupon bonds are provided by the US Federal Reserve and the Bank of England, respectively. The period of 1979 to 1982 is known to be econometrically precarious because of the so called US Federal Reserve experiment  . Hence, I investigate the period from January 1983 to July 2012. In line with ">1] , I use daily observations of 6-month, 2-, 5- and 10-year treasury yields. Table 1 reports descriptive statistics of US and UK treasury yields. The average US and UK yield curve is normal (upward sloping) and the short ends are more volatile than the long ends. The correlations within national bond markets are high (ranging from 52% to 95%). The cross country correlations are lower but still significantly positive. These high correlations imply that both yield curves are driven by a limited number of common factors. A principal component analysis provides information on how many factors the yield curve variation is depending  . The eigenvalue decomposition in Table 1 shows that a small number of factors describes a large share of the yield curve variation. In sum, two factors account for 85% and four factors for 96% of the yield curve dynamics. Means and standard deviations (Std) are reported in p.a. percentage points. Factor analysis is done via eigenvalue decomposition of the yield correlation matrix. Figure 1 provides insides into the economic interpretation of these factors. The first factor [Common Factor ]">1] has almost the same loading for both countries and all maturities. It is identified as a common factor and interpreted as “level”. For the second factor [Common Factor ]">2] the difference in loading of both countries across all maturities is close to constant. Therefore, I identify it to be the second common factor, interpreted as “spread”. 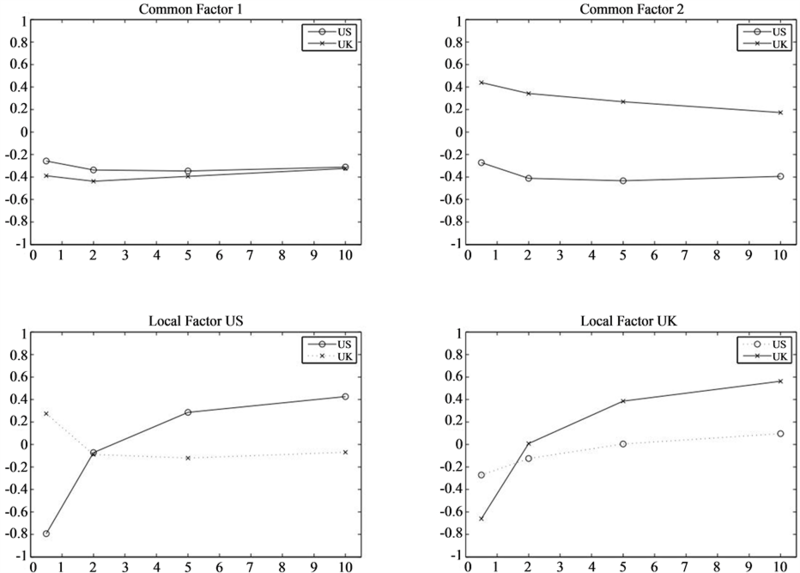 The factor loading of the third factor [Local Factor US] is different for the US and UK term structure. The loadings of the UK yield curve are close to zero. Hence, I identify the third factor to be US specific. Since it is a decreasing function of time to maturity it is interpreted as “slope”. The last plot draws the precisely opposite picture of the fourth factor [Local Factor US]. Whereas US yields play a minor role, the factor loading is a decreasing function of time to maturity of UK yields. Hence, I interpret this local UK factor as “slope”1. The factor analysis leads to the conclusion that the yield curve variation corresponds to two common factors and one local factor each. Significant improvements have been made in modeling single term structures for pricing bonds, interest rate derivatives and bond portfolios2. Two country models are a significant extension of single country models in jointly modeling the dynamics of term structures of interest rates. The previous section suggests that two common factors and one local factor each match the variation in US and UK treasury yields best. That is an model of the joint term structure in the  sense. Figure 1. Factor analysis. Factor loadings for US and UK yield curves. A principal component analysis is applied to changes of yields of 6 months, 2, 5 and 10 years time to maturity. In Equations (3) and (4) and are scalars and and are vectors. nests the local and common factors that drive both economies. Common factors enter both expressions of and through non zero and . Furthermore, the weighting of the factors for the specific country is expressed in the value of . If tends to zero for the common factor, the dynamics of the short rate are (almost) exclusively driven by the local factor. If, in contrast, is equally weighted for both countries, there is a common factor that drives the dynamics of both economies. This has important implications for international investors. If the short rates share risk factors investing abroad does no longer diversify domestic interest rate risk away. Hence, it is important to account for them in the model. is a 4-dimensional independent standard Brownian motion under and and are parameter matrices, and and are parameter vectors. i.e. is the level of mean reversion. The paper aims to provide an economic intuition of the model factors. Therefore, I define the risk premium to be non time-varying and use a completely affine Gaussian setup4. The domestic risk premium for US bonds is defined as , where is a parameter vector. The risk premium is country-specific and independent from the foreign risk premium, i.e. the risk premium parameter of the foreign factor is zero. Likewise, the UK risk premium is defined as , where is a parameter vector. where , , and satisfy ordinary differential equations (ODEs) with the usual boundary conditions  . The solutions to the ODEs for the process are available in closed form. and correspond to the yield data that has been presented in Section 2.  give a very practical closed form solution for US (UK) zero coupon bonds in vector notation. Without loss of generality and are assumed to be the common factors. is the US local factor and is the UK local factor. As both local factors are required to be mutually independent . Section 2 has shown that two common factors and one local factor each describe the variation in US and UK treasury bonds best. The corresponding joint ATSM has been presented in Section 3. The following section studies the interaction of yield and model factors. Since my model relies on a completely affine Gaussian setup, I follow  in using Kalman filtering with a straightforward direct maximum likelihood estimation. All maturities are observed with a certain error (see   ). Table 2 . 4-factor joint TSM parameter estimates. The table reports the estimation results from the four-factor joint ATSM. The estimation is done using daily US and UK treasury yield data from January 1983 to July 2012. I report the parameter estimates and the standard errors in parentheses. A * indicates parameters for the UK market. ε is the standard deviation of observational error associated with the 6 months, 2-, 5- and 10-Years treasury yields from the US and the UK. All other coefficients for the model are described in the text. factors with values from 0.0103 to 0.0136 . defines the factor dependence structure of the joint ATSM and each parameter κ is the same for both countries. Yet, the local factors are mutually independent and the factor dependence is set to zero . In the last panel the standard deviation of the observational error is reported. The model matches the data well. I obtain the biggest observational error for 10 year UK treasury yields with . For a standard three factor ATSM there is consensus in the literature to interpret the first three factors as “level”, “slope” and “curvature” (see    et al.). However, the case is a little more precarious in the present multi country model. The fitted common and local factors and treasury yields are reported in Figure 2. The first common factor is fitted to the “level” of US treasury yields. The second common factor is fitted to the spread of US and UK 5 year treasury yields in the second graph. These two common factors will explain the common movements of both economies, which correspond to 85% of the overall variation (see Table 1). The variation in yields that can not be explained by the common factors will be explained by the local factors. The local factor US is fitted to the “slope” of US yields which equals the spread of the 10 year treasury yield minus the 6 months treasury yield. The last graph of Figure 2 fits the local factor UK to the “slope” of UK yields. This is the variation in the UK data that can not be matched by the common factors. The local factors explain additional 11% of the total yield variation. All factors exhibit a very high correlation (i.e. up to 0.9848 for Common factor 1 vs “level”) to their economic intuition. These findings are line with   . find that “level” and “spread” are common factors whereas the “slope” factor is country specific. Figure 2 shows that common and local factors are not only an empirical phenomenon. Joint ATSM’s perfectly match the variation of international yields. Furthermore, the latent factors of the joint ATSM gain economic intuition which can be interpreted as “level”, “spread” and “slope”. Figure 2. Fitted factors in the four-factor joint ATSM and US and UK Treasury yields. The figure shows the local and common factors of the estimated joint ATSM. Each factor is plotted with its corresponding treasury yield. The first common factor is fitted to the “level” of US treasury yields (10 year US treasury bond). The second common factor and the spread between the 5 year US and UK treasury yields are plotted in the second graph. The third graph shows the local factor US and the slope of the US treasury yields (10 year - 6 months). The last graph shows the local factor UK and the slope of the US treasury yields. Factors and treasury yields run from the 2nd of January 1983 to the 31st of July 2012. “spread”. In contrast, the “slope” factor is country specific and corresponds to the local factors in the joint ATSM. I am grateful for comments from the brown bag series at Monash University, the participants at the workshops at EFMA Reading and WFC Cyprus, and Philip Gharghori, Jörg Laitenberger and Paul Lajbcygier. All remaining errors are mine, of course. 1The economic interpretation of the factors of international term structure models as “level”, “spread” and “slope” is in line with . find that “level” and “spread” are highly correlated across countries whereas the “slope” factor is country specific. 3In the following a * shall indicate the foreign economy. 4 argue that investors even prefer simple (completely affine) to more complex (essentially affine) models.